Ra-223 therapy is recommended for Castration Resistant Prostate Cancer (CRPC) patients with bone metastases. The standard protocol is 5-6 cycles of therapy with 4 weeks intervals to gain survival benefit. 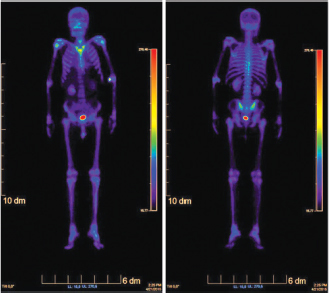 We report a case of a chemo-naïve CRPC patient who after 1.5 years of androgen-deprivation therapy had widespread bone metastases, PSA of 4186 ng/ml, alkaline phosphatase (ALP) at 2982 U/l, bone marrow involvement with anaemia and thrombocytopaenia. 223RaCl2 therapy was started in August 2014. After the first two cycles of 223RaCl2 PSA dropped to 70 ng/ml, ALP to 877 U/l. The third cycle was delayed for 5.5 months due to technical reasons. Unexpectedly, during Ra-223 therapy interruption the positive changes were still ongoing. PSA-level decreased further, to 0.28 ng/l and ALP to 254 U/l. 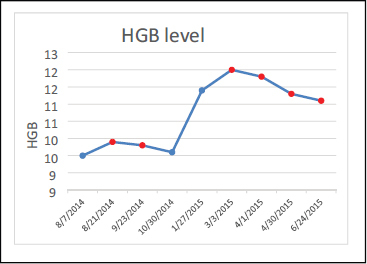 Hb level increased from 101 to 125 g/l, PLT from 105 to 180x109/l. After the interruption the patient received 4 planned cycles. Control bone scan after the 4th cycle revealed pathological uptake only in shoulder joints and sternum. In the follow-up period the patient demonstrated minimal disease signs: with normal ALP level, PSA 0.11 ng/ml. Ra-223 Therapy can give anti-tumour effect, as can be seen from the significant decrease in the PSA level. Breaks in Ra-223 Therapy are not dramatic. After interruption, it can be continued again. This fact can be taken into account while planning therapy. As shown here, clinical cases such the one we have reported, may allow a degree of flexibility to the standard recommendations on a case to case basis. Ra-223 chloride became a gold standard of treatment of Castration Resistant Prostate Cancer (CRPC) with bone metastases. ALSYMPCA trial and later investigations have shown benefit in overall survival in patients who received Ra-223 treatment compared with the placebo group [1, 2]. The standard protocol recommends 6 cycles of radium-223 therapy (55 kBq/kg dose) at 4-weekly intervals . Survival benefit has been shown in patients who have completed all 6 cycles compared with those who received less than 5 cycles . Sometimes, the following cycle can be delayed due to different reasons. The influence of these delays on the treatment outcome remains unclear. There are some retrospective data which have shown that there is no significant difference in the number of completed cycles or the median overall survival between those patients, who received their treatment in a planned way and those who experienced a 4-week treatment delay. Moreover, patients with unexpected treatment delay have shown significantly longer median progression free survival . Circumstances may interfere with the treatment schedule, which may beg the question: what is better for the patient, switch to alternative treatment method or restart Ra-223 treatment? We present a clinical case of long-term treatment delay of 5.5 months between the 2nd and 3rd cycles where despite the delay the patient showed clinical benefit. A 56-year-old man with high-grade prostate adenocarcinoma (Gleason 8) with widespread multiple bone metastases was diagnosed with CRPC after 1.5 years of initially successful androgen-deprivation therapy. After a relatively long period of stable disease under standard hormonal therapy, his PSA started to rise. The best standard-of-care at that time (February, 2014) was chemotherapy; however, the patient refused the treatment and opted for the then new investigational treatment with Ra-223. But as a result of a significant delay (6 months) in the starting date of the clinical trial, his PSA and ALP levels rose quite dramatically and he became mildly symptomatic for which he was prescribed analgesics. At the time of the start of treatment, his bone scan showed a “superscan” appearance, PSA was >4000 ng/ml and ALP level nearly reached 3000 (normal range: 0-120 U/l). Moreover, there was bone-marrow involvement, haemoglobin level dropped to 101 g/l, and platelet count dropped to 105 x109/l. In August 2014, the patient received his first cycle of Ra-223, which was well tolerated, followed by the second cycle 4 weeks later. 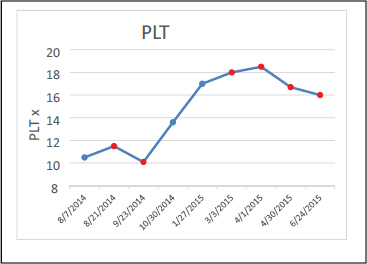 After the start of the treatment, the ALP level started to decline, and in 2 months time dropped from 2982 to 878 U/l (Figure 1); PSA level fell from 4186 to 70 ng/ml (Figure 2), Hb level and PLT counts remained on the border of acceptable (Figure 3 and 4). Unfortunately, the patient couldn’t receive his third cycle of Ra-223 in time, due to unexpected supply disruption. After the first two cycles, there was clearly a good biochemical response but both tumour marker levels (PSA and ALP), remained much higher than normal. In this situation it was difficult to predict which was the better of the two options: 1) switch to chemotherapy (abiraterone and enzalutamide were not available) or 2) stay without any kind of treatment until supplies were restored. However, the patient himself refused to undergo chemotherapy again and decided to wait until the supply was restored, which period lasted for 5.5 months. Unexpectedly however, Ra-223 continued to have a beneficial effect. During the shortage period, the patient didn’t receive any kind of treatment except for continuing with his standard androgen deprivation therapy (Zoladex). Despite the fact that the patient was neither given chemotherapy nor any of the new hormone therapies, his PSA level continued to fall, and was measured at 0.28 ng/ml at the 5th month of supply interruption (Figure 2). 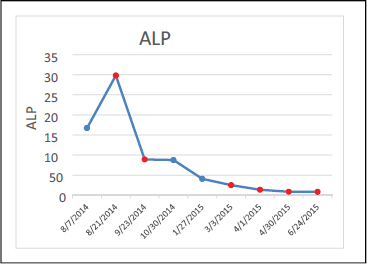 ALP level also declined, but was sill double the upper limit of the normal range (Figure 1). Thus, when the supplies restarted he received 4 additional cycles, so his treatment which initially started in August 2014 completed late by June 2015. The outcome of such unusual treatment schedule was nonetheless excellent with the bone scan, which was performed in April 2015 (after the 4th cycle of treatment), demonstrating nearly complete response, particularly when compared with the pre-treatment scan which had shown widespread skeletal involvement (Figure 5) and on the control bone scan only slight increase in 99mTc-MDP uptake in the shoulder joints and sternum could be seen (Figure 6). This case also demonstrated a relatively long progression-free survival of 37 months duration. 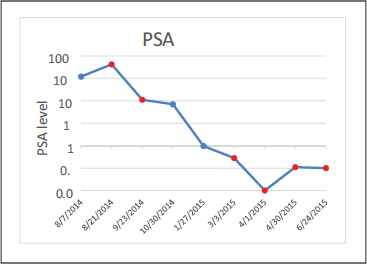 In September 2017, the PSA level again started to rise with the 11C-choline PET-CT revealing bone metastases only in the shoulder joints. The Ra-223 treatment schedule was approved in randomized placebo-controlled trials. The ALSYMPCA trial demonstrated acceptable safety profile and positive influence on survival . In fact, the treatment schedule was drown empirically. Investigators stay on the idea, that the number of completed cycles can influence on survival independently from the PSA, ALP and radiologic dynamics . The optimal time between consecutive cycles of Ra-223 remains unclear, different time schedules are not investigated. This clinical case demonstrated some unexpected advantages of long intervals between treatment cycles. When the patient started his Ra-223 therapy his blood counts were not very good, and he couldn’t be predicted to be able to complete all 6 cycles of the therapy. But during the treatment shortage his blood counts became normal. After resumption of the treatment, there was a slight decline in the platelet counts and haemoglobin level, which reflects the adverse effect of Ra-223. Thus, the unexpected shortage had some advantages in this clinical case. A previous report suggests that longer intervals between therapy cycles can prolong progression-free survival . 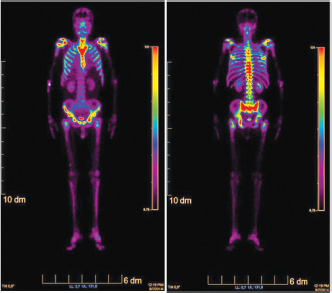 This clinical case has demonstrated possible advantages of long treatment intervals for patients with widespread bone disease and bone marrow involvement and a high risk of haematologic adverse events. In all reported cases the treatment delays were unplanned, but outcomes of these cases were positive. Thus, it appears that in some cases, the treating physician may consider changing Ra-223 treatment schedule in order to allow bone marrow to recover and prevent possible haematotoxicity. On the merit of this individual case, it may be assumed that in patients who show a good response to Ra-223, the occasional unavailability of Ra-223 for the following cycle, there may not be a need to switch to other kinds of therapy. It is however important to change treatment strategy in cases where there is evidence of disease progression. This case report has demonstrated that Ra- 223 acts much longer than 28 days, and has underscored the fact that treatment delays may not have a significant influence on overall patient survival. Moreover, in some clinical cases it may be better to lengthen the interval between consecutive therapy cycles, particularly in patients with widespread bone metastases and a low bone marrow reserve. This patient received Ra-223 according to the clinical study protocol NCT01516762, which was sponsored by Bayer. Parker C, Nilsson S, Heinrich D, Helle SI, O’Sullivan JM, Fosså SD, et al. ; ALSYMPCA Investigators. Alpha emitter radium-223 and survival in metastatic prostate cancer. N Engl J Med 2013; 369(3):213-23. Parker C, Gillessen S, Heidenreich A, Horwich A. Cancer of the prostate: ESMO clinical practice guidelines for diagnosis, treatment and follow-up. Ann Oncol 2015; 26(Suppl 5):v69–77. Saad F, Keizman D, O’Sullivan J, Carles J, Wirth M, Gillessen S, et al. 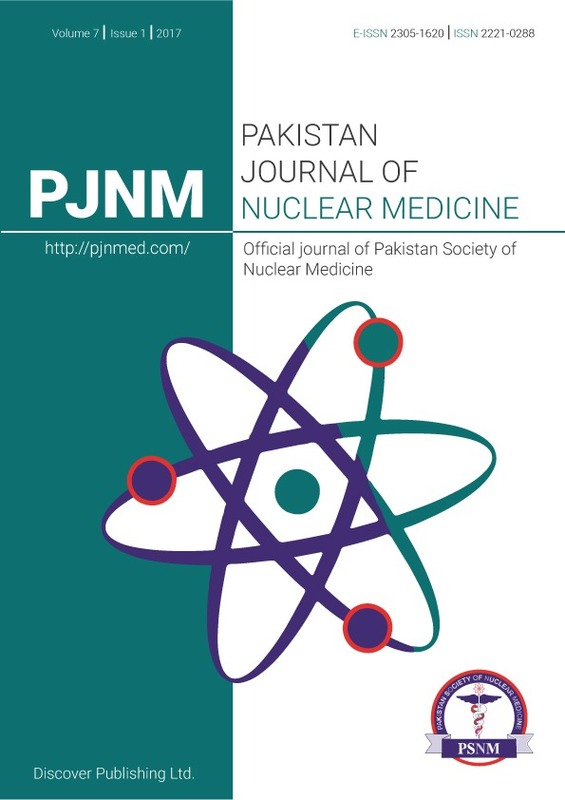 Analysis of overall survival by number of radium-223 injections received in an international expanded access program (iEAP). J Clin Oncol 2016; 34(15):5082–5082. Fosbøl MØ, Petersen PM, Daugaard G, Holm S, Kjaer A, Mortensen J. Impact of treatment delay in Radium-223 therapy of metastatic castration-resistant prostate cancer patients. Ann Nucl Med 2018; 32: 16–21.